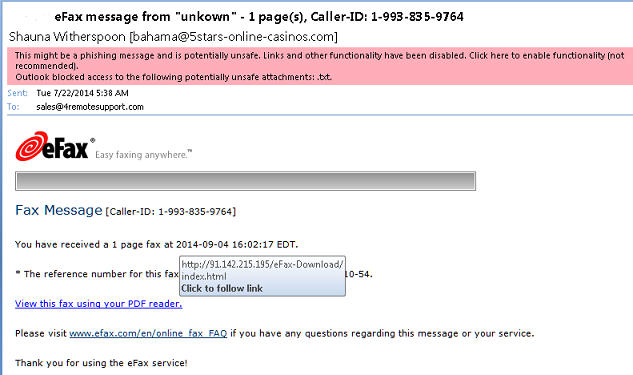 Fake eFax email notification of new Fax. With so many scams on the internet coming in the form of email. The two most common are emails with attached files, and the second most common is emails that look to be from legitimate sources but are spoofed (faked" to look real. They are from real legitimate companies doing real business and providing real services. The most common of those are conceived to look like email communications from banks. Since many people have become more savvy, the use of the fake bank emails has become less popular for the spammers and scammers. They use other methods such as the case of eFax, or documents sent from multi-function copier/scanners which we all have in our offices today capable of sending scanned documents to email. The subject will contain Xerox or Sharp or other well known manufactures of scanner/copiers as in many cases those subjects are part of the defaults of the configuration for the scanner/copier. The image in this post depicts one of those such scams. It looks like a real eFax notification and contains no attachments, just links. Clicking on one of those links will bring you to a web site that is not of course from eFax but instead a site that will contain malicious code in its pages. That code will attempt to add malware or some other malicious code to your computer and surely compromise your data and at times the integrity of your network. Another common fake email notification has been from shipping carriers like UPS. Once of the best ways to check for yourself to determine if the email is a scam and the links are fake is to hover your mouse cursor over the link. Hovering the mouse over the link will show the URL - the site that you will connect to if you click on the link. Depending on browser version, you will be notified of the potential risk and will be required to "approve" continuing to the site. Chrome does this kind of check for bad sites. Undoubtedly there will be unknowing individuals who will click on the links within this fake eFax fax message email notification. They will get a virus or two on their systems and perhaps a stealth Trojan that will haunt them, slow down their computer, or even worse hold their files for ransom. The message looks very real and only if you are somewhat knowledgeable or have excellent protection already installed on your system, the bad guys will get them. One point to note, as stated above, Chrome will warn the user and that will help prevent some of the spread of this fake eFax message containing viruses and malicious intent. Having Chrome installed is not enough, it has to be the default browser on the system in use. The link is clicked from within the fake eFax Virus email, the default browser opens and connects to tyhe web site.